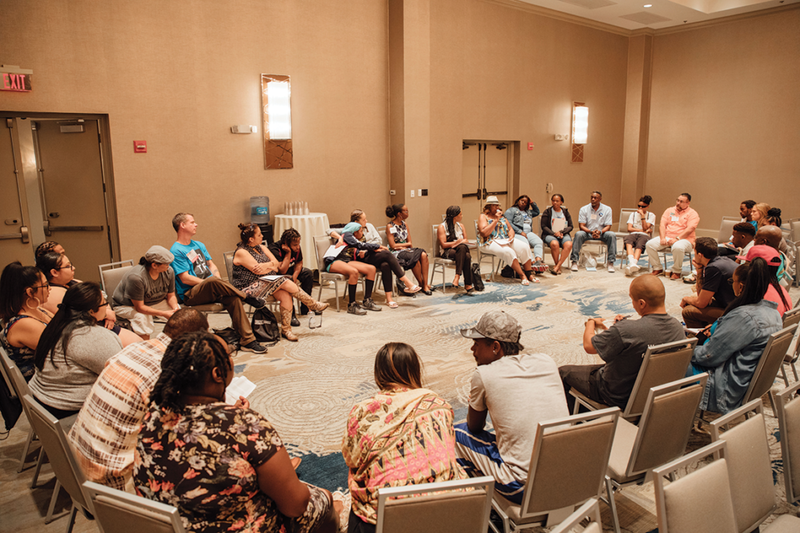 More than 50 social justice organizations led by formerly incarcerated people met in Orlando, Fla., last month. The occasion was the second national gathering of the Formerly Incarcerated, Convicted People & Families Movement ( FICPFM ). The first national gathering took place in Oakland in 2016. The conference’s theme this year was “A Quest for Democracy,” and its location allowed attendees to pursue that quest by getting out the vote for Amendment Four, a ballot item that Floridians will vote on directly in the November election [Note: it passed with a 64.5 majority vote–it needed 60%]. Florida is one of only three states that permanently denies the right to vote to everyone convicted of a felony, and Amendment Four would restore the right to vote to most of those people, giving 1.4 million Floridians their voting rights back. 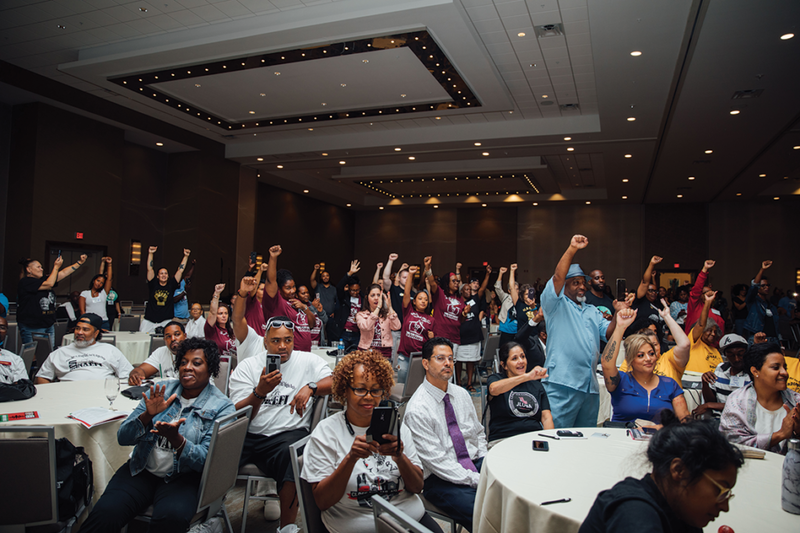 The conference drew around 1,000 people, almost all of them system-impacted in some way, whether formerly incarcerated themselves or family members of formerly and currently incarcerated people. Asha Bandele, one of the hosts of the conference, said the FICPFM is unique among criminal-justice re- form movements because it is led by people who are directly affected by the criminal- justice system. The conference featured an array of groups working on different aspects of criminal-justice reform, from family visitation to banning the box (prohibiting employers from asking about previous felony convictions on job applications). 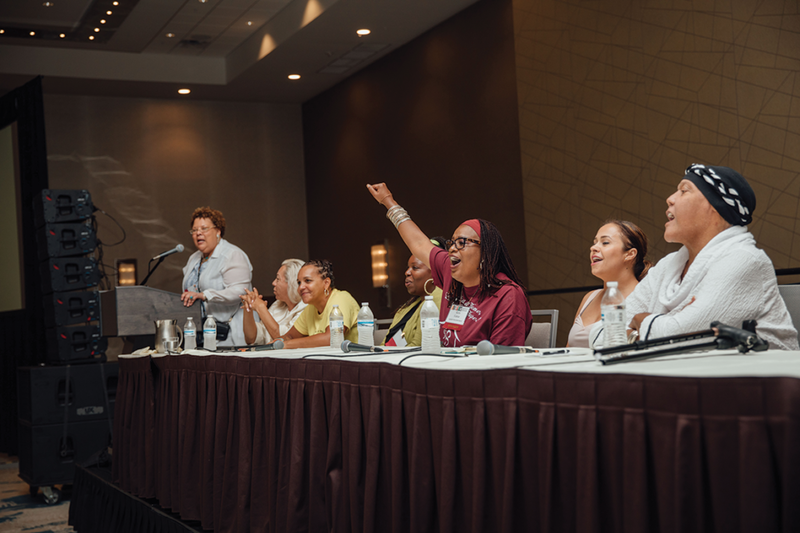 Groups representing formerly incarcerated women, LGBTQIA+ people and undocumented immigrants shared ideas and strategies at the conference. On the second day of the conference, organizers bused attendees to a local community center, where they phone banked, sent mass text messages and went door-to-door asking people to vote yes on the amendment. Conference organizers said participants contacted over 80,000 voters in less than four hours. Desmond Meade, the executive director of the Florida Rights Restoration Coalition, has been instrumental in getting Amendment Four on the ballot. Meade, who is formerly incarcerated, said his wife ran for office last election cycle, and he wasn’t allowed to vote for her because of his felony conviction. He said that although he could move to another state in order to get his right to vote, he doesn’t believe people should have to move to gain their rights in 21st-century America. His conviction to stay in Florida and fight for voting rights for all Floridians was reinforced during a plane ride several years ago. Kenneth Glasgow, of The Ordinary People’s Society (TOPS), registered voters inside Alabama jails leading up to last year’s special election in which Democrat Doug Jones beat Republican Roy Moore. Glasgow said that his group registered more people inside the jails than the total number of votes that Jones beat Moore by, meaning that if most of the people TOPS registered voted for Jones, his group’s efforts changed the outcome of the election. But Glasgow said he has paid a price for his efforts. He is currently facing a capital murder charge in Alabama in the shooting death of Alabama resident Breunia Jennings. Glasgow is not accused of pulling the trigger but rather of giving a ride to the man who shot Jennings. Similar to the former law in California (which was recently amended by SB 1437), anyone found guilty of “aid- ing and abetting” a crime is just as guilty as the person who committed the crime. Glasgow maintains that he had no idea the man he gave a ride to was planning to kill Jennings, and the judge over- seeing the case told prosecutors he didn’t understand why Glasgow should be charged with a crime. Other groups and individuals at the conference focused on topics such as over- coming childhood trauma in order to break out of a cycle of violence. Eddie Grijalva, a licensed clinical therapist with Son Life Ministries in Tucson, Az., said childhood trauma is a major factor in illegal and violent behavior and must be addressed as part of any comprehensive criminal-justice reform measure. Grijalva and his wife, Lori, are both formerly incarcerated, and the criminal-justice system has impacted the next generation of their family, as well. Lori Grijalva said famly members of incarcerated people are critical for building and shaping a movement like the FICPFM. LaTonya Tate was a conference attendee who has received a Soros Justice Fellowship to complete a comparative study of probation and parole practices in Alabama and other states. She has seen the criminal-justice system from two perspectives, as a former parole officer and the mother of a son who was incarcerated. Tate said one of the main benefits of having so many people from diverse organizations together at the same conference is the ability to share knowledge and form relationships. Dorsey Nunn, the founder of the San Francisco-based nonprofit All of Us Or None and a member of the FICPFM steering committee, said the movement has a broader goal beyond prison reform or voting rights for formerly incarcerated people. Nunn’s story serves as an inspiration for the formerly incarcerated people he works with at All of Us Or None and its sister organization, Legal Services for Prisoners with Children. After a stretch of incarceration at San Quentin State Prison in the 1980s, Nunn was able to build a nationally recognized social justice organization. He now fights for the rights of other currently and formerly incarcerated people. In 2015, he and other FICPFM members were invited to speak to President Obama, and Nunn credits that meeting with Obama’s later sup- port for nationwide ban the box measures, including a rule prohibiting the federal government from asking prospective employees about their incarceration record. “You know, I’m one of those people that can actually tell you I walked through the gates of San Quentin and the gates of the White House,” he said.